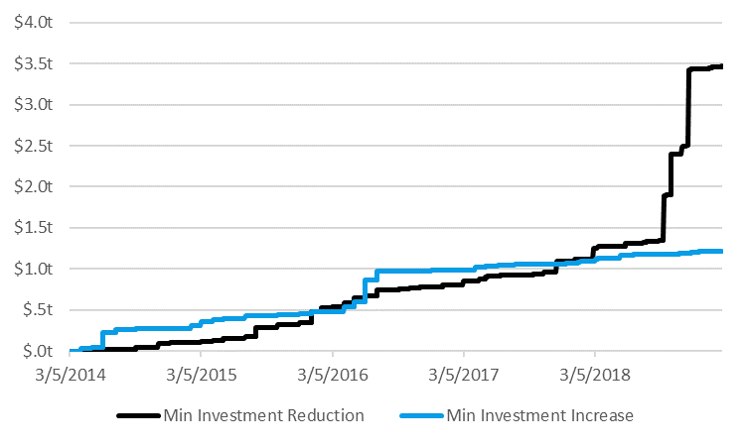 Asset managers will soon pay you to invest in their funds by implementing negative expense ratios, not for a short post-launch period, but indefinitely. Going from zero-fee to negative-fee funds may represent a psychological barrier for asset managers, but the barrier is arbitrary as it relates to asset manager profits. The winner-take-most price wars that passive managers are engaged in resemble the dollar auction game, which usually results in all auction participants losing by paying more than the prize is worth. True winners of the fund price wars are end investors, and specifically individual investors who have greater access to low cost investment products than ever before. Asset managers are competing for the assets of individuals, institutions, and retirement accounts. 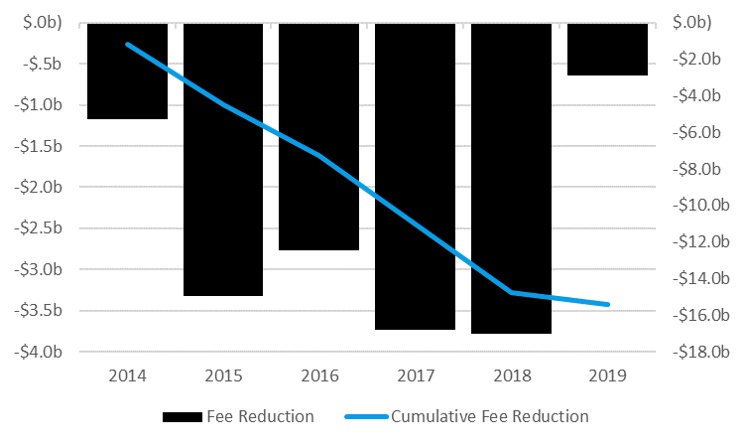 In 2018 alone, asset managers voluntarily gave up more than $3.5 billion in fees by reducing the expense ratios they charge for their products. Cumulatively since 2014, that number is nearly $16 billion. 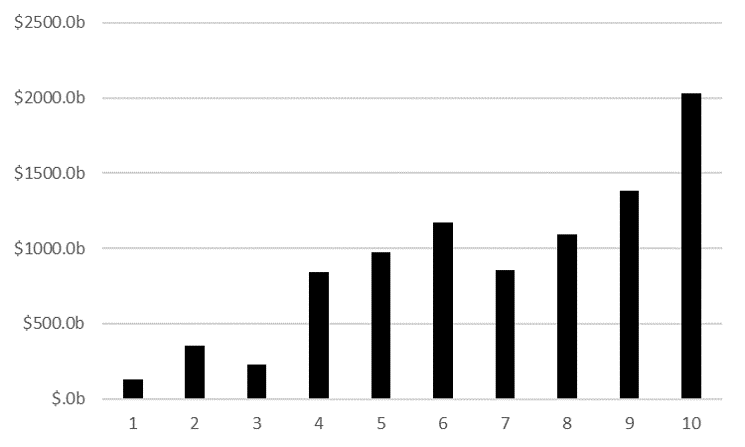 The picture becomes even clearer when we look at the distribution of fund assets across fee ranges. Products with expense ratios less than 5bps have grown 20 times faster than products with expense ratios greater than 20bps over the last five years. Some have suggested that investors will be too skeptical of a negative expense ratio fund for it to gather many assets. We disagree. When well-known fund families like Fidelity, JPMorgan, Schwab, and Vanguard are producing funds that offer plain-vanilla exposures to popular core segments of the market, investors will happily pay as little as possible (or gladly be paid) to hold such products. The dollar auction game, originally devised by economist Martin Shubik in 1971, has extraordinary outcomes despite its simple construction. Two players are given the opportunity to repeatedly bid in an auction for a dollar bill. The auction ends when one participant surrenders, allowing the remaining player to win the dollar bill. The winner and the loser are both required to pay their highest bid, and the players are not allowed to communicate with each other. There are two possible outcomes to this game. In the first, an equilibrium, the first bidder bids $1, and the second bidder, realizing they can only hurt themselves by entering, refuses to bid, leading to a neutral outcome for everyone. In the second, non-equilibrium outcome, rational players continue bidding up the dollar until they can take the pain no longer. Fund price wars are much like the dollar auction. The players (asset management companies) are bidding (by making fee cuts to their funds) for dollars (asset flows) repeatedly. Theoretically, they are also forbidden legally from colluding on prices. Although the mutual fund price war isn’t quite winner-take-all like the dollar auction, it is winner-take-most. Nearly all asset flows go to the cheapest funds within any given category. We have now seen our first zero net expense ratio funds, launched by Fidelity. We’ve even seen funds that offer temporary negative expense ratios for short periods after their launch. But if the dollar auction model holds true, we may soon see fund companies paying investors to invest in their funds indefinitely. As the proverb goes, there’s more than one way to skin a cat, and there’s more than one way to monetize a fund. 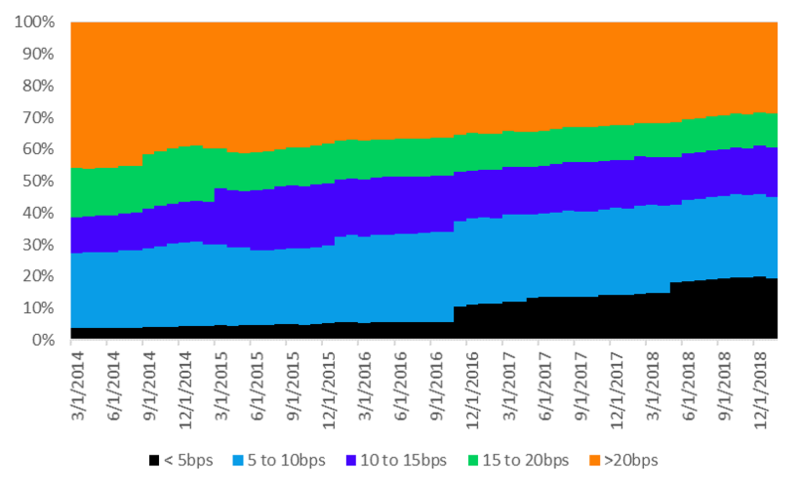 While traditionally, more revenue has been generated by expense ratios, securities lending has become a more prominent source of income for low fee funds recently. Securities lending is a practice whereby asset managers lend out their holdings to investors interested in borrowing them - typically for the purpose of selling them short. By some estimates, a fund can earn up to 30 or 40 bps of additional revenue from securities lending depending on the demand for borrowing its securities, and the supply of those securities from other lenders. That is, funds that own a great portion of securities that borrowers are eager to short will earn greater lending fees. It’s security lending revenue that allows us to imagine a world in which asset managers pay investors to invest. For large funds, securities lending revenue can more than cover the roughly fixed costs of running the fund, giving the asset manager cover to theoretically go into the negative-fee space. Furthermore, there is evidence that asset managers benefit from ripple-effects when an investor comes to one of their funds. That is, when an investor puts money into one fund within a fund family, they’re more likely to put money into that family’s other funds. This phenomenon could lead to asset managers adopting a loss-leader strategy whereby they use large flagship funds as loss-leaders to hook investors on their full product line-up. Vertically integrated asset managers, which also serve as financial intermediaries in some way, can further monetize their loss-leading position by cross-selling to investors on their platform, or charging other asset managers larger distribution fees to gain access to the platform. The pricing limbo - how low can we go? As the pricing bar continues to lower, and asset managers contort themselves further to gain assets while maintaining profitability, one has to wonder - who’s got the staying power and who will falter under the pressure? Theoretically asset managers are willing to supply an infinite amount of their investment strategies at the expense ratio they’ve settled on, creating a horizontal demand curve. So assets that end up in each fund are entirely determined by investor demand. So how does it all end? Like a financial thunderdome, only one asset manager survives the war of attrition. Managers will ultimately surrender as their technological prowess, ability to monetize a loss-leading strategy, or ability to market themselves effectively declines. At what ultimate price the winner prevails will ultimately determine whether they are cursed to have won. From a strictly rational point of view, going from zero-fee to negative-fee is an arbitrary step. 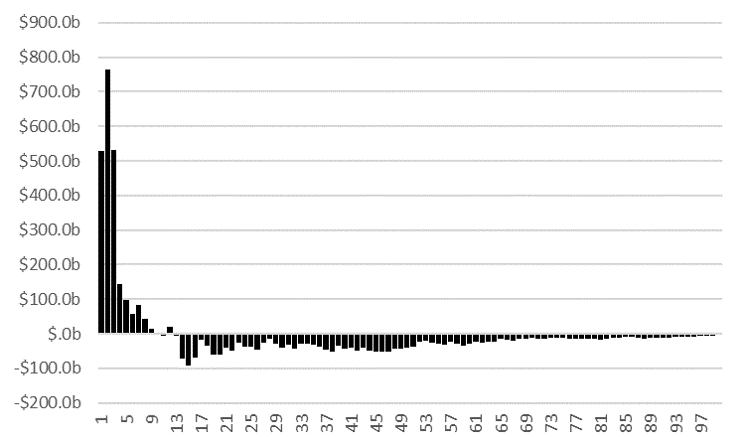 Aside from some negligible one-time infrastructure costs related to treating a traditionally positive number (net expense ratio) as a negative one in order to properly compensate investors, there is no financial difference between the transition from a 1 basis point fee to a 0 basis point fee and the transition from a 0 basis point fee to a -1 basis point fee. The same number of dollars will be given up in an effort to win assets. In fact, if anything, the first to go negative may benefit more given the press buzz that would be generated by the first fund to pay you to invest. Are negative fees a psychological bridge too far though? Maybe asset managers just can’t stomach the idea of paying someone to use a service they’re providing - it does seem counterintuitive after all. Then again, so did the idea of negative nominal interest rates (i.e. paying people to borrow money), but this is a reality in Japan and Switzerland today. What about investors - will they be skeptical of a fund that pays you to invest? They surely might be if that fund came from an unknown fund family or had an unusual investment strategy. But for a plain-vanilla index fund offered from a major fund family, we expect investors will be willing to pile into that fund as cheaply as they can, including being paid to invest. Who wins the price wars? In the dollar auction, the auctioneer is the winner - earning more money than the prize they give out. Likewise, the end investor is the winner of the fund price wars. In 2019, investors will pay $3.5 Billion less in fees across a product landscape that is as diverse as it’s ever been. Furthermore, individual investors are benefiting the most. Their access to low-cost funds has trailed institutional investors historically due to the negotiating power institutional investors bring to the table as a result of the large amount of assets at their disposal and the lower variable costs that asset managers have when servicing an institution. That’s all changing as asset managers have built out technology to service smaller investors at the same low cost as large investors, allowing them to lower the minimum investment requirements on their cheapest funds. Although no asset managers win in a price war, some lose less. Firms that create differentiated product line-ups are equivalent to potential bidders in the dollar auction who refuse to make an initial bid. They don’t allow themselves to be sucked into the game. Instead, these fund managers maintain their pricing power by offering hard-to-replicate investment. Fees have fallen, fees will continue to fall, and asset managers may, someday soon, pay you to invest in their products. This is a rational outcome of the price wars that passive investment managers have chosen to engage in. Securities lending and technological advances have allowed asset managers to remain profitable despite fee reductions - however both of these phenomena are bounded. Eventually, one-by-one, asset managers will surrender to the pain of low fees, ultimately allowing one manager to win most of the assets up for grabs. Murnighan, J. K. (2002). A very extreme case of the dollar auction. Journal of Management Education, 26(1), 56-69. Rowley, J. J., Jr., Kahler, J. R., & Schlanger, T. (n.d.). Impact assessment: Explaining the differences in funds' securities lending returns (Rep.). Shubik, M. (1971). The dollar auction game: A paradox in noncooperative behavior and escalation. Journal of conflict Resolution, 15(1), 109-111. ©Flowspring, Inc. All Rights Reserved. The information, data, analyses and opinions presented herein do not constitute investment advice; are provided solely for informational purposes and therefore are not an offer to buy or sell a security; and are not warranted to be correct, complete or accurate. The opinions expressed are as of the date written and are subject to change without notice. Except as otherwise required by law, Flowspring shall not be responsible for any trading decisions, damages or other losses resulting from, or related to, the information, data, analyses or opinions or their use. The information contained herein is the proprietary property of Flowspring and may not be reproduced, in whole or in part, or used in any manner, without the prior written consent of Flowspring.